A civilian officer hurled a "litany of abuse" at young Deepcut recruits the night before a teenager was found dead at the barracks, an inquest heard. 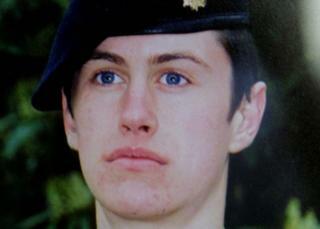 Pte Geoff Gray, 17, was found with two gunshot wounds to his head at the Surrey base on 17 September 2001. Billy Murphy, then a fire officer who lived on the base, admitted he was drunk the day before after watching football at a pub. The inquest heard he was denied entry by a female officer and became abusive. Pte Gray, who was born in County Durham and grew up in Hackney, London, was also on duty at the gate. Woking Coroner's Court heard the validity of Mr Murphy's civilian military ID was questioned and officers had to intervene. Mr Murphy, then 41, said his "litany of abuse was out of order". Asked by John Cooper QC, for the Gray family, if he had made "threats of violence", Mr Murphy said: "No sir, I am not a violent person." He said he could not identify the privates involved because of light shining in his eyes. Mr Cooper told the inquest Mr Murphy was led to his room by civilian officer Thomas McSeveney, whose own statement said he had to twice "remonstrate" with him. Mr Murphy said he had "no idea" what happened to Pte Gray, and discovered a police presence when he left his room to go for breakfast. Nicholas Moss, counsel for the Ministry of Defence, added that another officer, then major Paul Duncan, said he checked on Mr Murphy that night after the shots were fired, finding him in his room. Privates Sean Benton, 20, Cheryl James, 18, and James Collinson, 17, also died from gunshot wounds at the base between 1995 and 2002.